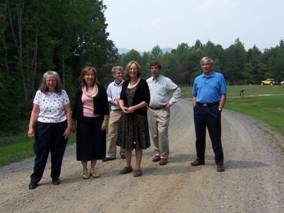 On Friday, August 31, 2007, the Stagebridge Community Association held its 3rd annual membership meeting at the home of Bob and Lauren Carter, 263 Stagebridge Trail, Lovingston, Virginia. Members in attendance were the Carters (lot 1), Mike and Anne Knasel (lots 6, 10, 11, 12 and 13), and new owners Rob and Diane Ayers (lot 4). Also in attendance as guests were architect Todd Dykshorn and builder Ezra Hitzeman, with Christopher Page and Stephen Mathis representing Stagebridge LLC. 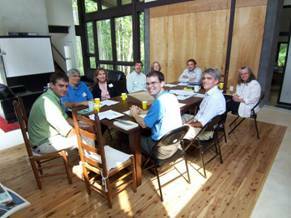 Rob and Diane Ayers were welcomed to the Stagebridge community as new members. Following introductions, owners and guests were treated to a tour of the Carters’ home. 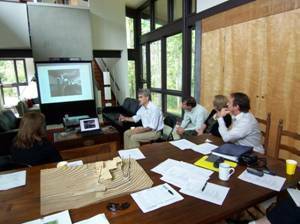 The focal point of the meeting was a presentation by Bob Carter of the design and construction process of their home. Todd Dykshorn and Ezra Hitzeman helped to narrate the presentation, answering questions about design, topography, planning and the actual construction. (See contact information below for Todd and Ezra). The Carters and their architects started the planning process with pictures of historic homes that appealed to the Carters. Todd Dykshorn used these photographs to develop an initial concept for the lot at Stagebridge. The goal was to take advantage of the views and topography in the design. The Carters stayed in close contact with the Stagebridge LLC office during the entire process to assure the home was compatible with the community. After considering quotes from several builders, Ezra Hitzeman of Lost Industries was selected. Starting with the design, he developed both a wish list for the final house and a final budget. The goal was to balance the two throughout the construction of the home. It was critical to include the builder early on. All the participants were pleased with the final outcome. The Carters home is a testament to thoughtful planning. 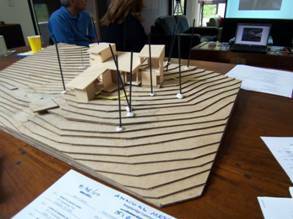 Over lunch, members and guests discussed the design and construction process. Also discussed were the state of maintenance at Stagebridge, current membership and community association finances. Community finances remain healthy, with no plans for changing the maintenance fees at this time. Plans for upgrading Stagebridge Trail are currently under way. There was a brief review of the current marketing campaign for the remaining lots. While there has been a slow down in the real estate market, values at Stagebridge remain high. Open visiting days are to be held throughout the fall and several venues are being used to create marketing visibility for Stagebridge. Community members are invited to participate through offering suggestions and contacting potential owners. Updated community directories are available for owners’ use. As always, additional information is available through the Stagebridge LLC office and at www.stagebridge.net. Here is everyone at the meeting enjoying lunch. The model of the Carter’s home.